The jungles of Colombia are home to many animals, including monkeys. The monkey family is represented well, with Colombia serving as home to more than a dozen species. Although many species exist, some are highly threatened. 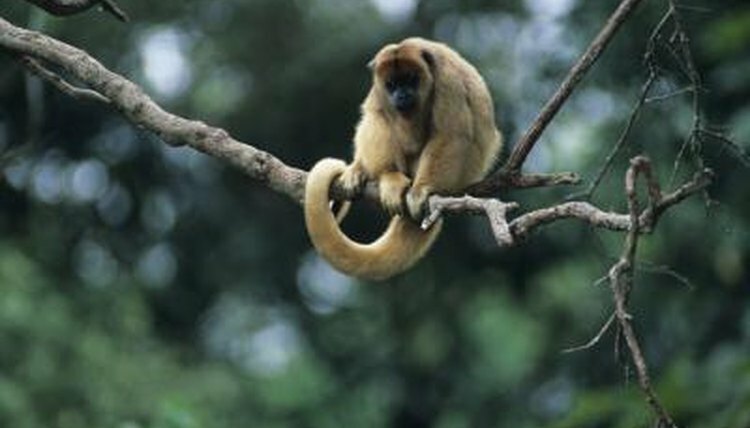 The Colombian woolly monkey, for example, is critically endangered, meaning it's at risk of extinction. The List of Countries of the World website lists almost two dozen primate species that live in Colombia. All are monkeys -- as opposed to apes -- and include several species of capuchins, tamarins and others. From the Colombian squirrel monkey to Ma's night monkey and the red howler monkey, this South American country just over 1,000 miles south of Miami has the warm, tropical environment to sustain such a wide variety of these jungle animals. White-fronted and white-faced capuchins are two Colombian monkey species. White-fronteds are light brown with some yellow and red markings, and a dark stripe down their spines. Their faces are covered with lighter hair. Males are larger than females, and they run in groups of 15 to 35 members. Their diets consist mostly of fruit. White-faced capuchins have distinctly white faces and shoulders against darker fur, live in smaller groups of four to six, and are omnivores, unlike the vegan white-fronted capuchins. As with capuchins, more than one species of tamarin monkey lives in Colombia. The mottle-faced, black-mantled, silvery-brown bare-face, cotton-headed and Geoffroy's tamarins all call Colombia home. These species live in groups of unrelated adults, with both male and female members. Groups are generally led by one dominant male and female pair. Tamarins feed on a range of foods including insects, flowers, fruits, gums, saps and small animal prey like frogs, snails or lizards. Tamarins generally give birth to twins. In 2010, scientists on an expedition found a monkey species they'd heard about but never located. In the Colombian region of Caqueta near the Peru and Ecuador borders, they found the red-bearded titi, also known as the bushy-bearded titi. The creature is about the size of a cat and is one of several titi species. Other monkey species living in Colombia include night monkeys, squirrel monkeys, howling monkeys, spider monkeys, uakari or uacari, marmosets and woolly monkeys.